PUREX is a chemical method used to purify fuel for nuclear reactors or nuclear weapons. It is an acronym standing for Plutonium Uranium Redox EXtraction. PUREX is the de facto standard aqueous nuclear reprocessing method for the recovery of uranium and plutonium from used ("spent", or "irradiated") nuclear fuel. It is based on liquid–liquid extraction ion-exchange. Pyroprocessing is a process in which materials are subjected to high temperatures (typically over 800 °C) in order to bring about a chemical or physical change. Pyroprocessing includes such terms as ore-roasting, calcination and sintering. Equipment for pyroprocessing includes kilns, electric arc furnaces and reverberatory furnaces. Cement manufacturing is a very common example of pyroprocessing. The raw material mix is fed to a kiln where pyroprocessing takes place. As with most industries, pyroprocessing is the most energy-intensive part of the industrial process. Argonne National Laboratory pioneered the development of pyrochemical processing, or pyroprocessing, a high-temperature method of recycling reactor waste into fuel. Today, Argonne National Laboratory researchers are developing and refining several pyroprocessing technologies for both light water and fast reactors, with most based on electrorefining rather than conventional wet-chemical/PUREX, to improve the technologies’ commercial viability by increasing their process efficiency and scalability. Before running off making highly exciting statements, we caution that the worlds largest and longest reprocessing company has been France's AREVA, now Framatome. They have processed steadfast for years on the original PUREX system. Although the Pyroprocessing method is functioning, the research is STILL working to reach commercial viability. Only then will it be considered for corporate investment. These things STILL point profitable used nuclear fuels to the future. The human desire to forever continue to resolve obstacles which hinder the future continue to be in the cross-hairs of our RESEARCH! 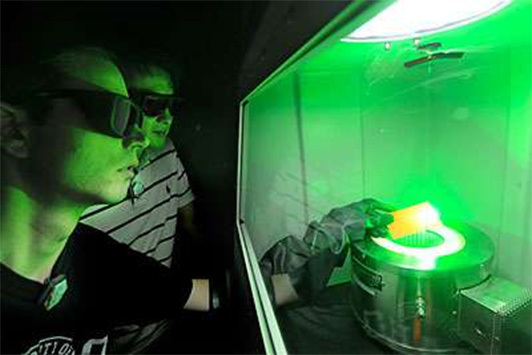 The future of nuclear fuels reprocessing is with, Laser-Induced Breakdown Spectroscopy. A couple things to think about! USNEF would like to state that we work diligently at trying to be accurate with our research and responsible with statements that we make. Our technical comments are often reviewed by the industry experts who serve on our Advisory Board. The communication paths between science, engineering, politics, business and the grassroots public are complex. It is complicated to produce documents for this varying group of people because they each have their own perception of data processing. We have been mining for gold and silver for centuries. The technology for the mining process has never stopped advancing. This is the cycle of research and development. The success to every business market is timing. You can either be too EARLY, or too LATE! If your product is not market ready, it will fail. Every country in the world has, or is seeking the ability to produce nuclear power. In spite of some countries reducing nuclear interests, others are building, so, the future market potential for spent nuclear fuels will continue for at least several hundred years. The slowdown of the nuclear energy market was caused by ill-founded opinion which simply caused the market stagnation. Originally 400 plants were planned for the U.S. market. That number would have easily cut the capital costs in half. Had nuclear been allotted the tax credits allotted for carbon free energy and considered a renewable, the long term capital investments would have leveled. Opposition by other energy sources also contributed to demonizing nuclear. Based on many of these factors and the pace of research, and, the construction process, we do not see reprocessing as competitive market for a couple decades. 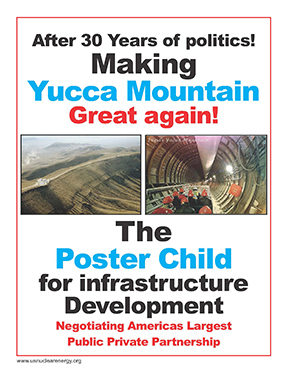 For this reason, we continue to support the completion of the Yucca Mountain Application Review Process. As the study completes, move forward with consolidating our complete U.S. spent fuels inventory to the Yucca facility. Then, “begin the dialogue” of a world class reprocessing facility at Yucca Mountain, AND, plan on this construction as another 20-year program. Such a massive public works program must be consolidated in one place. To propose that reprocessing could occur at 70 of the locations nationwide is absurd. To propose that a world class reprocessing center could be built in less than a decade is also absurd. The only way that such projects “could” come to fruition would be through long-term planning with ALL Western U.S. national laboratories; Sandia in New Mexico, Lawrence Livermore, California, Pacific Northwest, Richland Washington, Idaho National Lab. ID. Integral to the Yucca Application study, it should also be noted that 8 of America’s national laboratories were involved in contributing data to the application study.